Leave your stereotypes behind when you think about things to do in Sacramento. As it turns out, the city is more than just the boring state capital. While many Sacramento sights center around the Gold Rush, the early days of the Pony Express, and state government, there's plenty more to do indoors and out. When you visit Sacramento's Old Town, you may feel like you suddenly stepped backward in time to the mid-1800s. And you have, in a way. Old Town is a historic park full of historic buildings, but don't think that sounds too boring. When you go to Old Town, you can have a meal, do some souvenir shopping, and check off several places on this list, including the California State Railroad Museum, the Underground Tour, and a river cruise. The Old Town Sacramento guide has more information about the area and its history. 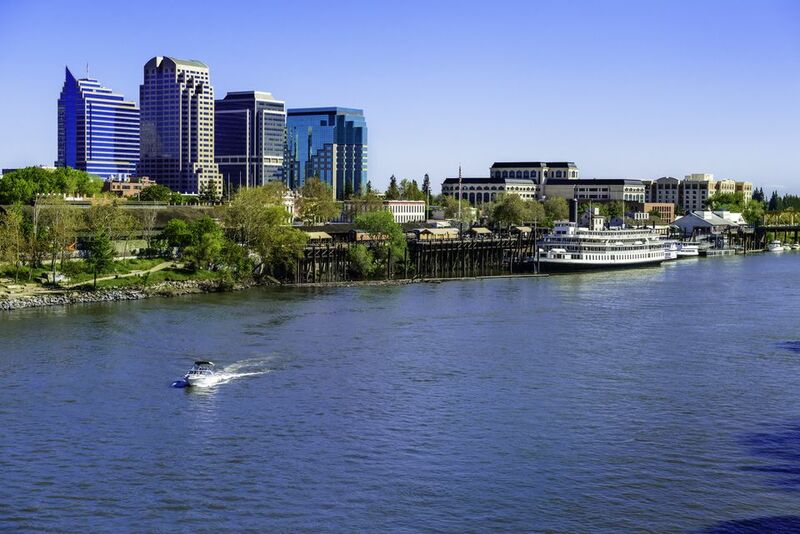 Taking a river cruise can give you a look at Sacramento from a different perspective. From the deck of a river cruise boat, you'll float past the Delta King Hotel, the I Street Bridge, the Tower Bridge, and the Air Force Docks. On a relaxing, one-hour trip you can see the city, rest your tired feet, and learn more about the city and its history. Hornblower Cruises offers cruises several times a day. They also offer happy hour and cocktail cruises along with themed holiday trips. Reservations are a good idea (especially during the summer and holiday weekends). You can get to the Hornblower dock on Front Street by going up the ramp between their ticket booth and Joe's Crab Shack, taking the stairs to the right of the Rio Cafe, or taking an elevator from the Delta King. Sacramento's Squeeze Inn makes a burger that wears a skirt (of sorts). The Squeeze With Cheese features a beef patty ringed with cheese that spreads around it, melted and crisped to perfection. If that sounds familiar, television star Guy Fieri once visited for his show "Diners, Drive-Ins and Dives." Unless you have a particularly hearty appetite, this is a treat best shared. If you have any capacity left after consuming the Squeeze, head for Gunther's Ice Cream, where the flavors include old-fashioned favorites like Butter Pecan and Rocky Road alongside Thai Tea and Mango. It's worth the trip to Gunther's (at night) just to see their "Jugglin Joe" neon sign, especially if you're into taking cute photos and videos for social media. Since 1940, neon Joe has been tossing a scoop of ice cream into the air — and it always lands in the ice cream cone he's holding. If he ever misses, they say the ice cream is free. This tour reveals a dirty little secret about Sacramento: It's Jacked Up! Literally. To avoid flooding, the city streets were raised in the mid-1800s, leaving behind a network of hollow sidewalks, sloped alleyways, and the underground spaces abandoned below street level. You may love this tour, especially if you like history, but it's not for everyone. Some people say it’s more like walking through an old basement than really going underground, but most say it’s excellent. Young children may get bored and restless. The two-hour tours begin at the Sacramento History Museum. They also offer a nighttime Underground After Hours Tour. Tour season runs from early April through the end of December, and they often sell out, making it a good idea to buy ahead of time through their website. Tours leave precisely on time. Get away from the historical and political parts of Sacramento to explore its up-and-coming side in Midtown. Just east of downtown is where you'll find a growing array of top-rated restaurants and edgy art galleries, alongside coffee houses, breweries, bistros, and boutiques. Visit the neighborhood on Saturdays for the Midtown Farmers Market which features both fresh and prepared foods. Once a month, you can follow that up by enjoying even more artwork at the Second Saturday Art Walk. To get into more of the Midtown vibe, you can take a guided tour with Explore Midtown to see the area's murals or indulge your sweet tooth on a dessert tour. Midtown is roughly bounded by H and S Streets between 16th Street and 29th Street. You can find plenty of parking in the area. The Sacramento River Train takes you on a 14-mile ride, traveling at a leisurely 10 to 15 miles per hour. That's slow enough to have time for dinner, enjoy a wine or beer tasting event, or watch an entertaining show. They host regular murder mystery trains and themed excursions that include a Wild West showdown, and also make holiday-themed trips. One of their most popular events is the Magical Christmas Train with Skippy the Traindeer. Reservations are a must and making them as far in advance as possible for their special events is a good idea. With 225,000 square feet of space and a collection that can take hours to explore, the California State Railroad Museum is the place to find out why the railroads were so important to California and the Western United States. The collection of steam locomotives alone is impressive: 19 of them dating from 1862 to 1944. But that's only the start. They also have other rolling stock that includes passenger cars, cabooses, dining cars and more. They also offer excursion train rides that take you along the banks of the Sacramento River. The California State Capitol Building is where the state's governing takes place, but it's also a museum, preserving many of its historic offices, legislative chambers, and artwork. Free public tours are given daily, with no reservations required. The tour office is in Room B-27, in the basement of the Capitol. Enter the building through the N Street entrance. The Crocker Art Museum features the works of California artists, from the contemporary to the avant-garde. It is housed in the Crocker Mansion, the home of an early California Supreme Court judge who collected the artwork that formed its original collections. Next door to that is the Teel Family Pavilion, a 2010 expansion that tripled the museum's size. The museum is open several days a week and is located a few blocks from the river and the Tower Bridge. Leland Stanford was not only the founder of Stanford University but also governor of California, a U.S. Senator, and chairman of the Southern Pacific Railroad. During his time as governor, he lived as you might expect a wealthy man of his day to live: in a 19,000-square-foot mansion with 17-foot ceilings, gilded mirrors, and crystal light fixtures. Today's visitors can get a peek at what the place was like in its heyday. Free tours are offered daily. Take yourself on a walking tour with one of these self-guided brochures that cover City Hall, J and K Streets, and the State Capitol area. Sac Tour Company offers tours of "Lady Bird film" locales including the blue house, tree-lined streets of the Fab 40s neighborhood, Club Raven, and Pasty Shack. They also offer walking, running and biking tours for active visitors. Local Roots Food Tours take you walking and eating around town, giving you a chance to connect with restaurants and their chefs, as well as artisan food shops and their owners. On a tour with Sac Brew Bike, you and a group of others will pedal along Midtown Sacramento streets on a mobile bar stocked with local brews, visiting some of the city's best craft beer purveyors. Bikes aside, Sacramento is home to a growing number of craft breweries, and there's more than one way to check them out. If you'd rather taste beer without the pedaling, try Sacramento Brewery Tours.